His last pole came almost five years ago on September 27th 2002 at Kansas Speedway, but today Dale Earnhardt Jr earned the pole for the Pennsylvania 500 at Pocono Raceway. Although he did earn the top spot for tomorrows race, it almost didn’t happen. During his turn to qualify it started to rain, but he managed to control the car and returned to the pits to wait out the shower. Fortunately with the high local temperatures and humidity the track dried quickly, and qualifying was able to continue, with Jr setting the fast time being the first runner after the shower. “Well, the car handled perfect. We had a lot of help. First I want to credit Martin Truex, Jr. and Bono (Kevin Manion, crew chief on No. 1 Monte Carlo SS) and the Bass Pro guys. They’re car was really good here last time and we learned a lot from that and brought a lot of those things back, mechanically, on our car; and it’s been good all day long. So the car handled really, really good,” commented Earnhardt. “The weather come and cooled the track down a little bit and obviously that’s going to help us quite a bit to be able to go even later in the day,” Earnhardt said. “It sped the track up for us to be able to take advantage of that and get the pole. So I was really happy about that. As in most cases it seems after a driver announces they are leaving a team, performances improve, and in Juniors case this could be due to his deals for next year being in place. Without any uncertainty he and the team can focus clearly. 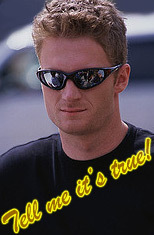 Whatever the case, it’s working and hopefully we will see Junior in the chase in a DEI Bud sponsored Chevy this year.